As you can see from the image, I clearly lied above and went all out with this month’s fossil fish which is an elegant beauty, preserved in such a way as to resemble Falkor the Luck Dragon from the Neverending Story, a magical film lessened by two sequels which were unarguably nowhere near as good. 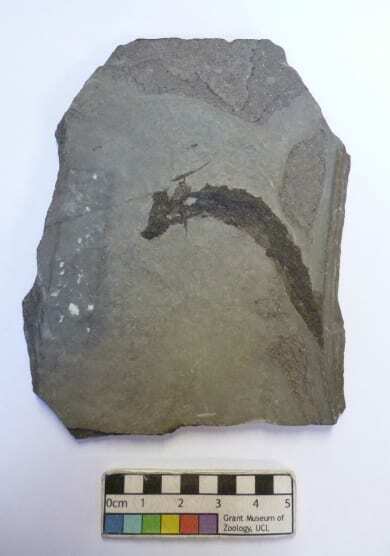 According to the ever reliable label for this specimen, this fish is Ischnacanthus gracilis collected from the Devonian rocks of Forfar Scotland which makes this graceful fish around 400 million years old. Ischnacanthus gracilis is a species of grab-bag group acanthodian ‘spiny shark’ fish, jawed fish which had cartilaginous and bony skeletons, some of which were the ancestors of today’s sharks, rays and skates. Most of these fish were active predators that hunted smaller fish and other swimming organisms. Given that much of their skeleton was not made of bone, what normally remains of these fish is the various spines they possessed (hence the informal name, spiny sharks) and this specimen isn’t much more than an organic sphere with spines, resembling a fossilised marmalade with bits in made of fossil fish and not oranges and served on sedimentary rock not toast, or if you fancy, crumpets. Don’t believe me? Here’s photographic proof, in colour, which means it must be true. This is actually in colour although it doesn’t look it, it is. Believe me. Preservation Although this specimen appears to be preserved in the middle of a graceful leap from the sea like one of those motivational poster dolphins it’s a trick of the eye. From what I can make out it looks like this is the underside of the fish as this reconstruction from an up-an-coming-young-yet-mature-beyond-their-years palaeoartist attempts and fails to make marginally clearer. Not much can be made out from this specimen aside from the odd spine which can be discerned. Like last month’s underwhelming fossil fish this specimen is mostly an amorphous layer of black preserved in a suspiciously fish-shaped shape. Research For a short time, I thought we had a worldwide underwhelming fossil fish exclusive in that there didn’t appear to be a single research paper about this species or genus. That would have been very exciting. However, it transpires that I’d accidentally missed out the ‘c’ from the genus. There’s ever so slightly more than nothing but not a huge amount. A number of papers mention Ishchnacanthus gracilis specimens from MOTH, which unfortunately is not a super villain organisation or even as exciting as a camp 1960s secret international counter-espionage organisation. It is in fact an acronym for Man on the Hill, a place in the Mackenzie Mountains of Canada where these fossils were thought to have been found. Even less interestingly however, is that a paper from earlier this year, confirmed that none of the specimens from MOTH are in the genus Ischnacanthus although they are ischnacanthid, in the family Ischnacanthidae (Blais, Hermus & Wilson 2015). Of course, there doesn’t seem to be a species of acanthodian fish that former curator of the Grant Museum, D.M.S Watson didn’t cast his eye over when he literally wrote the book The Acanthodian Fishes. In his chapter on Ischnacanthus gracilis, Watson describes three specimens from his own collection showing exquisite preservation, two of which he took with him and one of which is listed as ‘lost’ in the Grant Museum catalogue. As far as the fossil fish featured in these pages go, this species is one that still gets a mention in the literature. EXPECT A HIGH RESEARCH SCORE FOR THIS ONE. In Society A good indicator of whether a fossil fish has had a broader impact in society is whether or not it has a Wikipedia page. Even a stub article indicates some influence. Failing that, the next level is whether anyone uses the genus or species as a username on a forum or not. Sadly, there seems to have been little to no love for Ischnacanthus in wider popular culture. However, this specimen somewhat resembles Falkor the Luck Dragon from the Neverending Story which is the first film I ever cried at (the horse bit so I am told) so perhaps fitting that this is the last underwhelming fossil fish of the month blog I’m writing as the Grant Museum curator and oh, look I’M CRYING AGAIN NOW. UNDERWHELMING FOSSIL FISH OF THE MONTH WILL CONTINUE??? 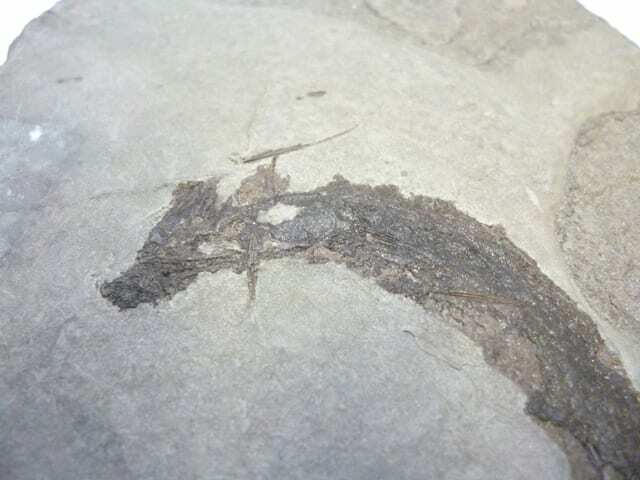 Underwhelming Fossil Fish of the Month has been one of my favourite places on the internet for more than two years now and if this really is the end, hats of to you for making such an underwhelming subject interesting, funny and fascinating. Never would I have guessed that fish paleontology could be this exciting! Favourite month: September 2013, with the mention of the Stockholm School Fossil Fish Rat Pack. Least underwhelming fish: April 2013, that Hoplopteryx was actually quite whelming! 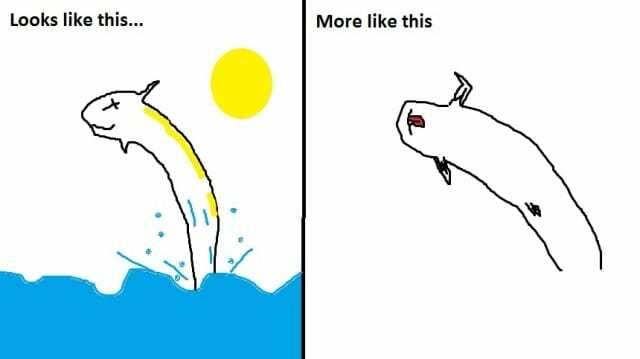 Also appreciated: the illustrations. Fantastic. With a hope for many more underwhelming fossil fish to come, thank you for these past years. Thank you very much, happy to have underwhelmed! Do you mind if we use this for as the sleeve quote for the inevitable DVD series? Of course not, happy to help and I look forward to a signed copy! I’m going to force it to continue, because I’m not back on BBC Inside Science until mid Spetember, when I WILL be making this into something amazing for Radio 4 listeners. Does Oxford not have a load of underwhelming fish fossils? I’m sure we can find some. May I serenade you with the song ‘Oh Please Don’t Go’? I have been so thoroughly overwhelmed with your underwhelming fossil fish over the past years – an absolute joy. Thank you so very much!